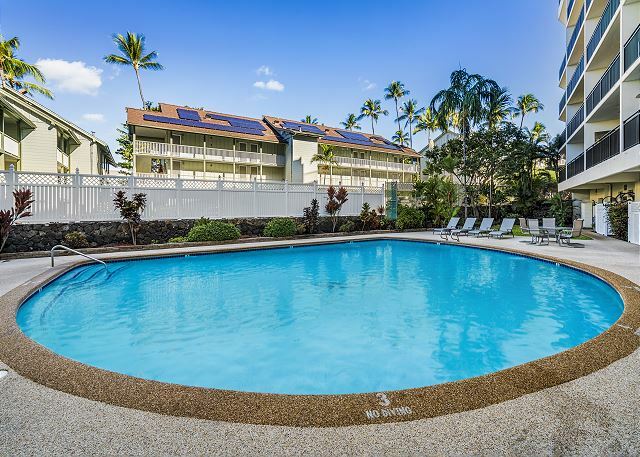 Right in the middle of town in walking distance from the Kona Pier. Remodeled and AC included. The unit has a Queen size sofa sleeper so can sleep 4 people comfortably. Stroll down Alii Drive and you will find a variety of shops and restaurants. 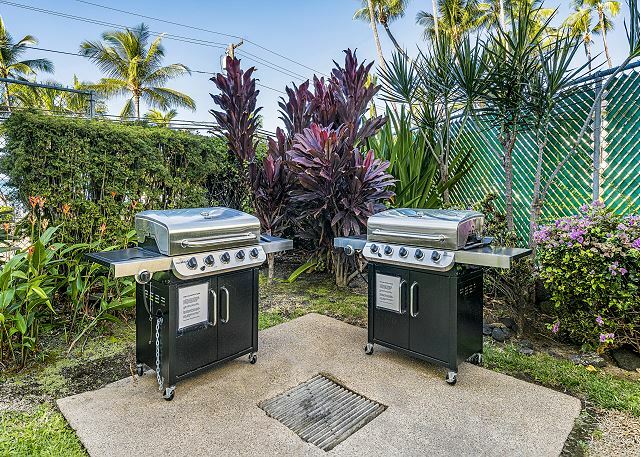 Nearby restaurants include Splashers Grill, The Fish Hopper, Huggo's, Don the Beachcomber, Kona Inn Restaurant, Kona Canoe Club, Outback Steakhouse, Bubba Gump Shrimp Co, Island Lava Java, and Bongo Bens Island Cafe and the list can go on. We really enjoyed the convenient location and view.Very clean unit that had everything we needed. A little noisy but bedroom was quiet. Great management. 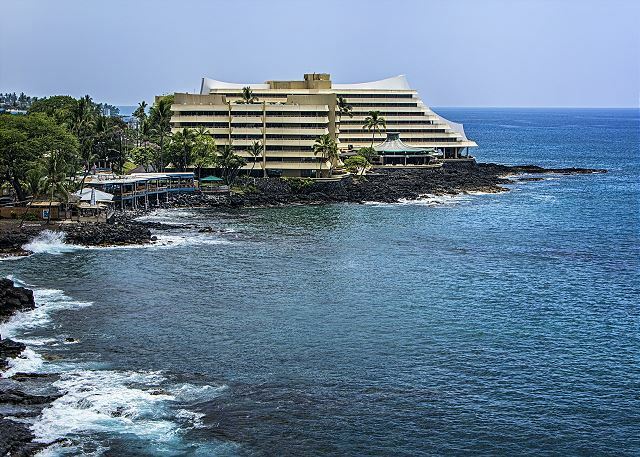 Thank you for posting this review of your experience at Kona Ali'i 201! We are happy to hear you had a beautiful stay at an excellent location with noticed amenities and cleanliness. Thank you. We sincerely hope to see you again soon, Mahalo! The view from this condo is incredible. It is so nice just to sit on the lanai. There are bars and restaurants within walking distance as well as an ABC store for groceries or other necessities. There's a farmers market also a short walking distance. 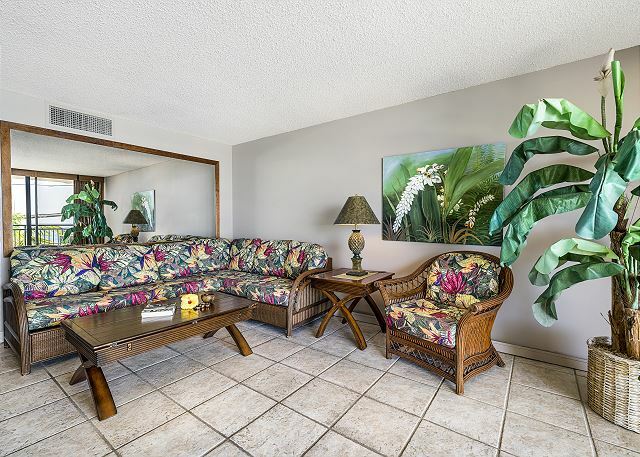 The condo comes with beach towels and chairs which was very convenient. The noise was also not an issue. When the doors are closed you barely here a thing. The issue I had was figuring out how to get in when we first arrived (I assumed the lockbox was at the door, but it's actually by the elevators). Luckily one of the tenants helped us figure it out. Overall, this was a wonderful place to stay and would definitely rent it again next time I'm on the big island. 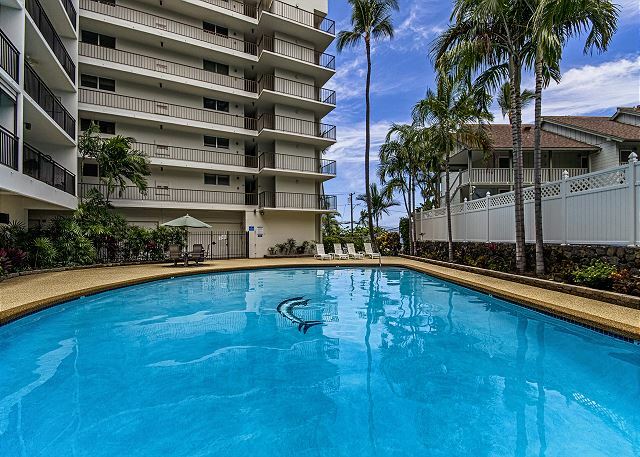 Mahalo Julie, glad to hear that the condo was the incredible experience you were hoping for! We encourage you to return, contact Boundless Hawaii directly for the best possible pricing! 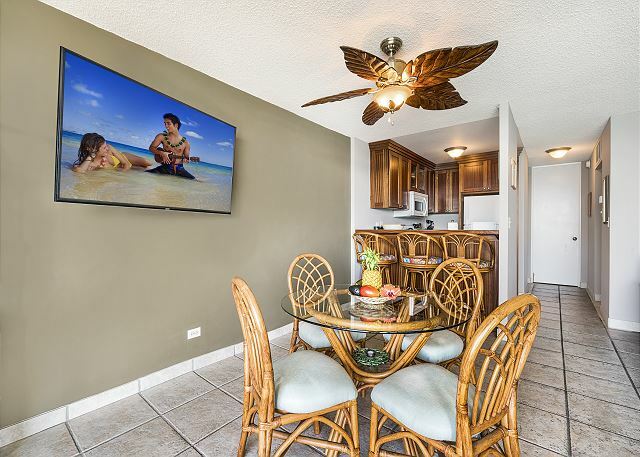 This was the perfect condo for location and Kona ambiance! We could walk and get our fresh fruit in the morning at the stands or there are lots of restaurants to get a great breakfast. 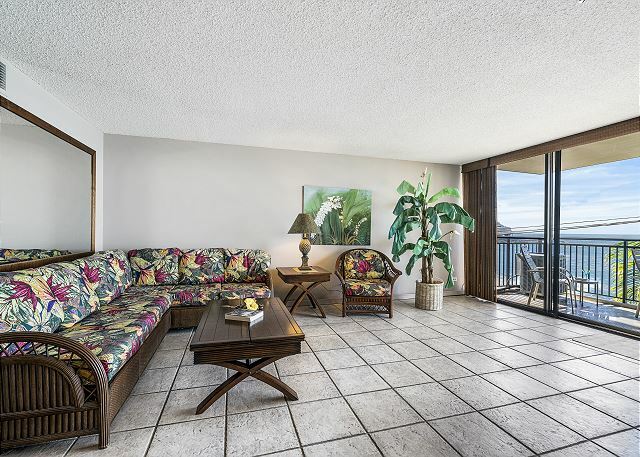 The condo and lanai were large and roomy and it really felt like a home away from home with a waterfront view. We thank you for your review! 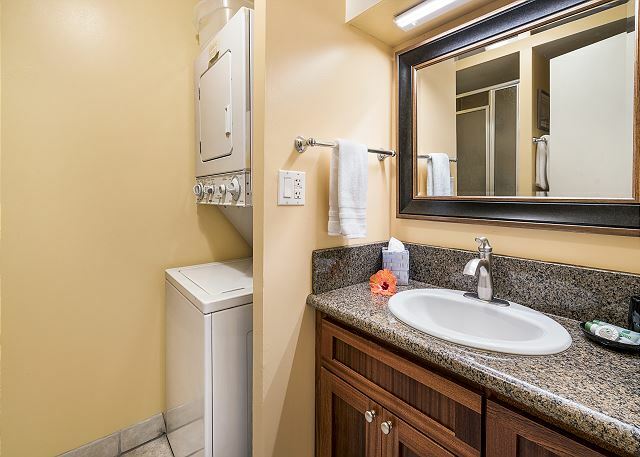 Your home away from home await your next visit! Location was great. Would book again. Thank you Bonnie for reviewing your stay with us! We would love another opportunity to accommodate you and to encourage your return we offer our return clients a loyalty discount! This is the 2nd time we have stayed in this Condo (201 Kona Alii). We love the view from the Lani and Living Room. We enjoyed the Dolphins jumping out in the bay, the Christmas Parade that was on Alii Drive, had front row seats. 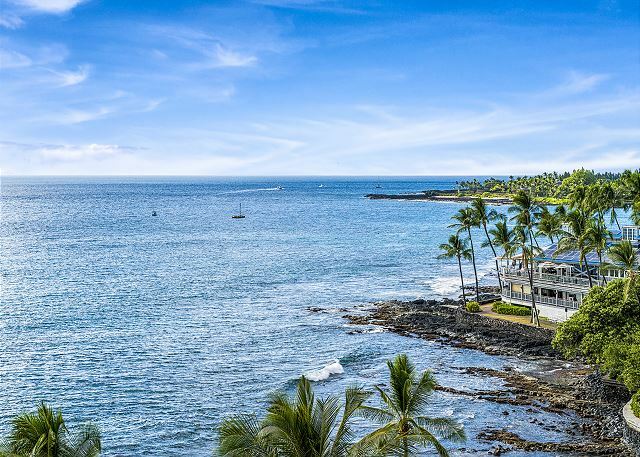 The closeness to downtown Kona, pier, farmers market and the restaurants. The Condo was very clean. Only complaint is the noise sometimes on Alii Drive. We will be back, thanks for everything that Boundless Hawaii did. If they would enforce noise ordinance in evening that would help enhance location. Sunsets from here were AWESOME. Thank you Sharon for your continued loyalty to Boundless Hawaii! I apologize that the noise from the street in front took away from your vacation. My recommendation is to shut the doors to the Lanai and turn on the complementary A/C this will reduce the noise by two folds. Hope to see you return the dolphins will be waiting! I loved our location right in downtown Kona! We could walk to places and only get in the car when we wanted to. I had thought it might be loud with the town sounds but it was very pleasant to be at this location! Aloha and thank you for your wonderful review. We are happy that you enjoyed your stay and hope you will let us know when you intend to return to Kona. As a returning guest, we are happy to offer a 10% discount on your next visit! a guest from GREENSBURG, PA does not recommend this vacation rental. 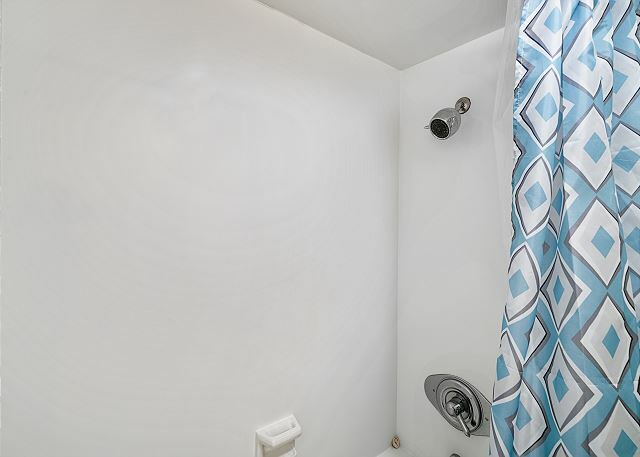 THIS UNIT IS PRICED RIGHT BUT IN NEED OF UPDATES....THE BED, THE DISHWASHER, AND OVERALL LIGHTING. THE KITCHEN LIGHTING IS THE WORST. THIS LOCATION IS NOISY BUT CONVENIENT TO EVERYTHING. THANKFULLY THE AIR CONDITIONER DOES WORK WELL. KEEPING THE GLASS DOORS CLOSED HELPS WITH THE NOISE. Aloha, thank you for taking the time to reach out. It sounds like some of the light switches may have been overlooked during your visit. We hope that you do return to any of our units and contact us immediately when you encounter issues so that we can assist. The kitchen and lighting were newly remodeled within the last few years. 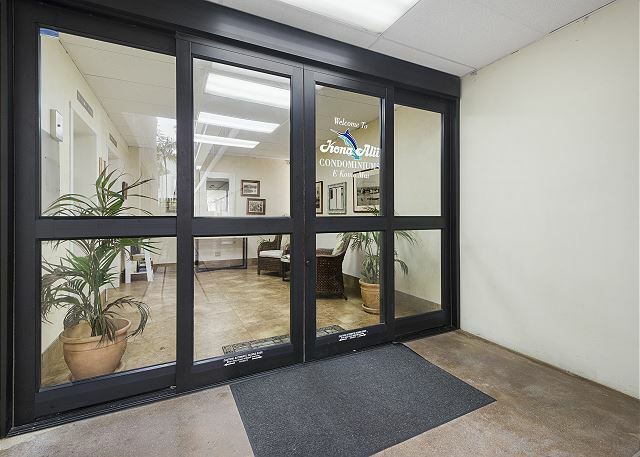 We would be happy to host you for a return visit in any of your units, perhaps a location away from the bustle of downtown Kona. Remember, returning guests receive a 10% discount for reservations booked directly through Boundless Hawaii. Boundless Hawaii staff went out of their way to help us get in when the lockbox wouldn't open,in a very timely manner. Very polite and helpful staff. Aloha, thank you taking the time to leave a review. We would be happy to host you again! Remember, returning guests receive a 10% discount for direct bookings. Now that you've been "trained" on the lock box, it should be quick and easy to enter on your next visit! A great stay at the Kona Alii. It was well located and had nice views oft he bay. 15 wonderful days in paradise. We had a very wonderful time in Condo. Beautiful sunsets and pleasant views. One day for a couple of hours we watched spinner dolphins playing in the water in front of the Condo. Great places to eat close by. Enjoyed the music at the Lava Java restaurant next door. Clean, nice pool and very private. Only problem which you don't have control of is the noise on Alii Drive. Great spot, exactly has described. 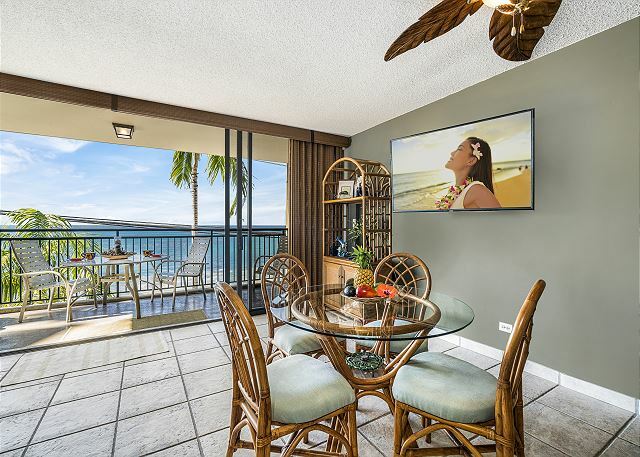 The unit was clean, the kitchen was packed with absolutely everything we needed and the lanai was a perfect spot for breakfast. We were concerned that the car traffic would be pretty disruptive, but the sound of the waves crashing seems to drown out all the street noise. Light Hawaiian music came form the restaurant next door, which was a wonderful addition. 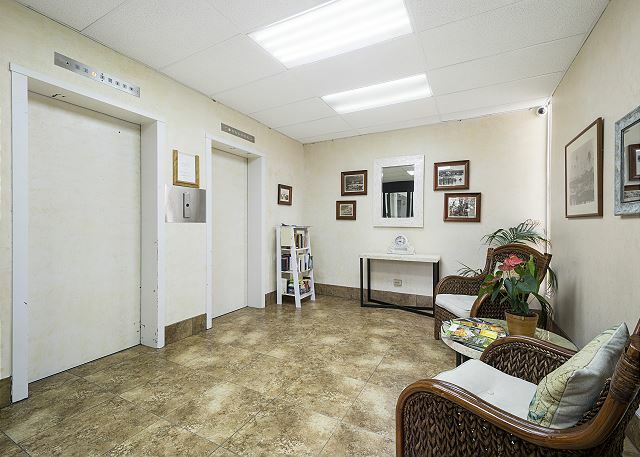 Excellent location, right in the middle of town next to unlimited shops and restaurants. The location and view was even better than we expected. Super convenient, steps to tons of restaurants and shops. The suite was newly and beautifully renovated and maintained. We had a car for the week to get to the spectacular beaches north of Kona and would reccomend the same. Nice condo with a great location! Wonderful view of the ocean, where we were able to watch dolphins in the morning while enjoying coffee and breakfast. 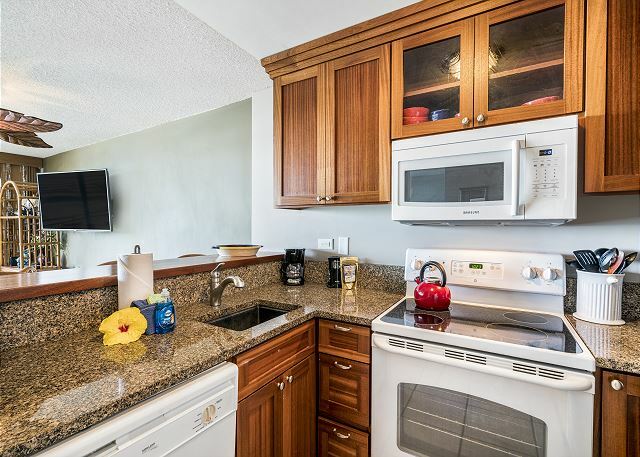 The condo had all the dishes, utensils, etc that we needed, and also had useful items such as beach towels, coolers, mats, beach chairs, and sunscreen. 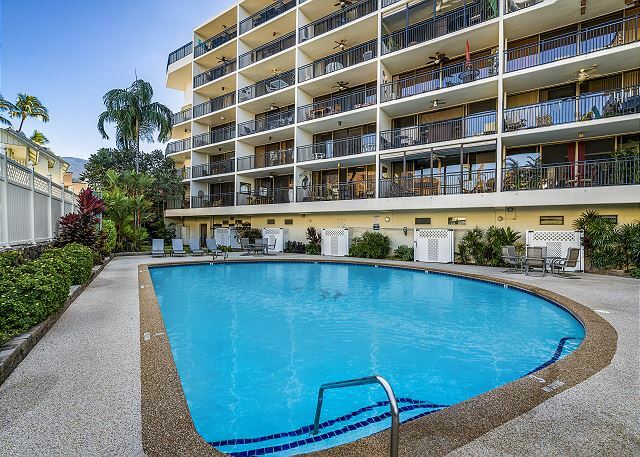 Walking distance to many shops, restaurants, and activities. Loved our stay here! 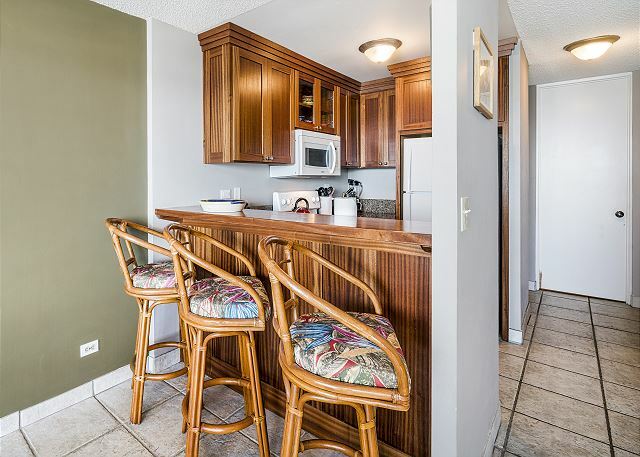 The location of this condo was in the very centre of tourist activity in Kona. Restaurants and shops were in walking distance, and the ocean crashed ashore right across the road. The suite was well equipped and clean, and our contact with the rental agency was very successful. Nice to find a place on short notice in the busy season.We enjoyed sitting on the Lanai and listening to the live music from Lava Java right next door and almost feeling the spray from the surf on the beach at the same time! 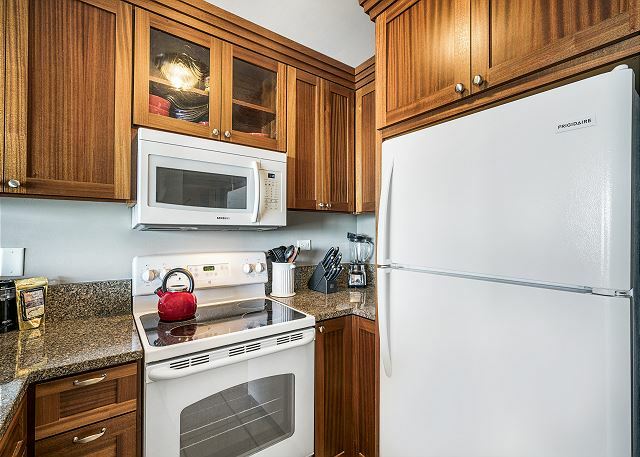 The condo was fairly well stocked although could have used a few more items in the kitchen such as a potato peeler and large salad bowl. Couldn't ask for a better location! Everything was just as advertised. Any prior concerns about lack of dishes, etc were completely addressed and the unit was wonderfully appointed. Also, some very nice little touches set out by the Boundless management company which I did not expect in a condo rental, but appreciated so much. 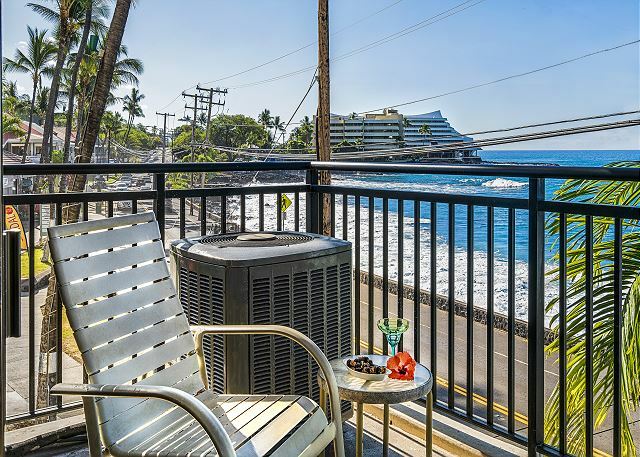 Can't think of a much better way to spend vacation than waking up and drinking my Kona coffee on that spacious lanai with the spectacular view! The unit was clean and fairly well appointed. It's ocean front, so the waves are breaking 60 ft away across Alii Dr. You do get some street noise, worse in the AM. Surprisingly, if you're sleeping in the living room, the surf can be more disruptive than the street noise. But the view from the lanai as you have your morning coffee is completely worth the price of admission! 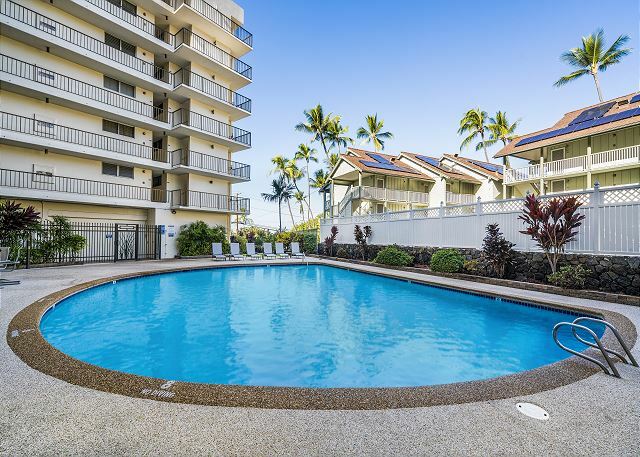 Kona Alii is perfectly situated in Kailua Village to access the entire "strip" from Coconut Grove Ctr to the Pier on foot. And the pool is the best I've seen in Kona. SECOND FLOOR WAS NOT OUR FIRST CHOICE. WE TOOK IT BECAUSE OF THE AIR CONDITIONING. WE KNOW KONA ALII VERY WELL. OUR FRIENDS OWN IN THERE SINCE IT WAS BUILT. THE VIEW IS MUCH BETTER AND MORE PRIVACY FURTHER UP. BEING AN OWNER OF A VACATION RENTAL ON ALII DRIVE I HAVE A FEW SUGGESSTIONS. A LARGER TV IN THE LIVING ROOM AND REARRANGING THE FURNITURE. THERE IS NO WAY YOU CAN SIT ON THE COUCHES WAY ACROSS THE ROOM AND WATCH THE SMALL TV. WE MOVED TWO OF THE CHAIRS OVER CLOSER AND PUT A MAKE SHIFT COFFEE TABLE IN BETWEEN THEM SO WE COULD WATCH TV. THEY SHOULD GET BETTER CABLE CHANNELS TOO. THEY CAN EXPAND WHAT THEY HAVE THERE.